* No significant change in the units status. * Operations to use the 50 meter boom/water pump system on Unit 4 completed. * Power restored to Unit 1, 2, and 3. Unit 3 main control room is powered. * Concerns continue regarding use of seawater in the reactor and that through evaporation in the core the there could be a concentration of salt. Asked them is boron was also being included in the RST/Japanese evaluation and yes they are including the previous boron batched with seawater, but the RST believes there is sufficient boron to retain shutdown reactivity margin. RST therefore recommends use of clean water when available. * Dose rates continue to trend downward around the site. 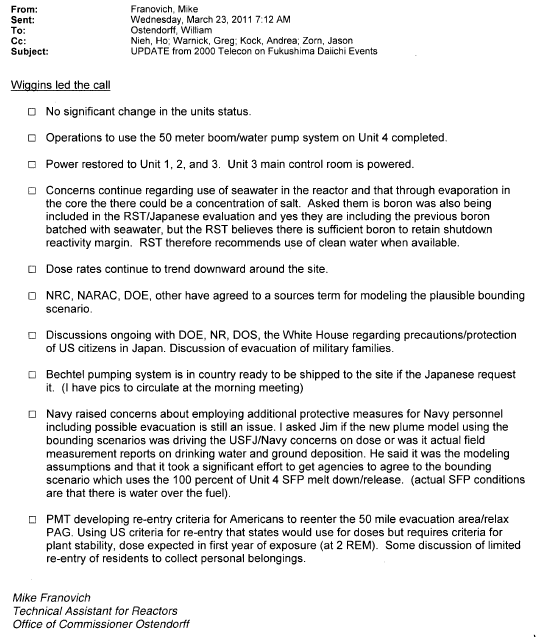 * NRC, NARAC, DOE, other have agreed to a sources term for modeling the plausible bounding scenario. * Discussions ongoing with DOE, NR, DOS, the White House regarding precautions/protection of US citizens in Japan. Discussion of evacuation of military families. scenario which uses the 100 percent of Unit 4 SFP melt down/release. (actual SFP conditions are that there is water over the fuel). * PMT developing re-entry criteria for Americans to reenter the 50 mile evacuation area/relax PAG. Using US criteria for re-entry that states would use for doses but requires criteria for plant stability, dose expected in first year of exposure (at 2 REM). Some discussion of limited re-entry of residents to collect personal belongings.